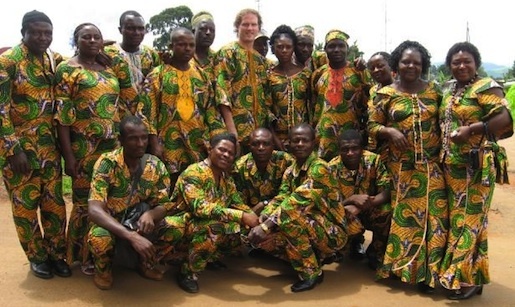 Cameroon clothing - A description of the traditional attire of Cameroon. Traditional Attire and Dress Fashion of Cameroon. Cameroon clothing - traditional attires, vary greatly from one region to the other defined by religion, tribal heritage, climate, customs and beliefs. In the northern region of Cameroon, for instance, which is predominantly muslim, arid hot with a rich flan heritage the customary traditional attire is light colorful free flow robe and head covering enriched with embroidery worn by both male and female with some gender modifications. While in the southern region - predominantly christian, rainy, lots of forest land, and a Bantu heritage, dresses are multi-layered with fascinating mixtures and matches of customary elements embroidered on them. These dresses take a considerable about to time to produce and are very costly. Pagnes are very handy to Cameroon women. Cameroon girls use it to carry their babies on their backs (dorsal back) , or to provide sheade for their head in extreme heats, and or to warming up during the rainy seasons. Pagnes are large turbans made of fabric. In villages across Cameroon, Cameroonian men and women wear more traditional dresses while in cities the men favor more western style dresses or a modern flair of African-European attires. Cameroon city girls favor a mixture of traditional and western style dress - Pagnes along with blouses, shirts and a mixture of such called Afritude. 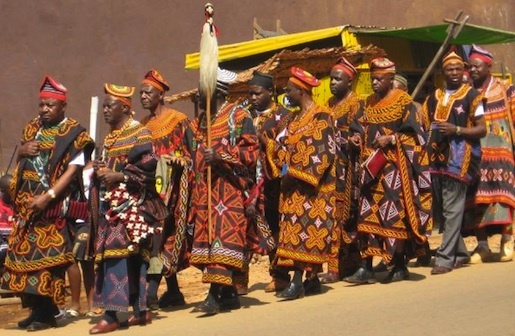 Religion, climate and colonialism 's influence on Cameroon clothing is very visible. Kabba - a one-piece free flowing female garments - seamlessly from neck /shoulder area to knee and below. Mostly worn for casual occasions and mostly home choirs. Prefect fot free body movement and climate condition. Boubou - free flowing male garment consisting of one to four pieces - an inner wear, an outer wear with large pockets, a pant and a head cap. Very popular in the northern region of Cameroon and can be found in almost any part of Cameroon during special occasions. Colourful embroidery is traditional to Northwestern province of Bamenda Cameroon. At first they all look alike but notice the differences in styling colors, bags, etc. Everything detail is unique and represents the tribe, individuals position is the village, family lineage and more more. Very fascinating. Pagnes (Sarongs aka San-njea , aka Wrapper) blouse- style female traditional attire. Pagnes are worn by Cameroon women allover cameroon. Gant worn by both male and female as part of Cameroon's cultural heritage.